If you survived Groundhog’s Day, Valentine’s Day, Presidents’ Day, Fat Tuesday/Mardi Gras, Ash Wednesday & even an extra Leap Day, then the rest of the year should be a cake walk! 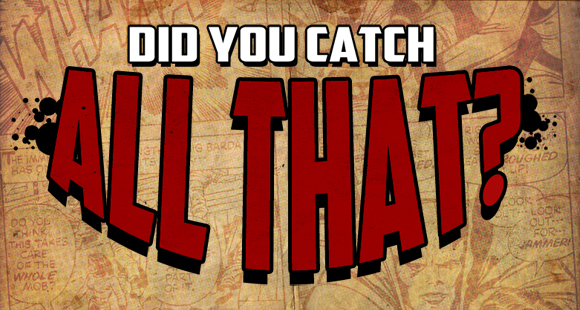 If you fell into some kind of time lapse and missed all the good stuff that came out in comic news this month then let Simon, Sheldon & Susan walk you through the month of February 2012 with an all new “Did You Catch All That”. First and foremost if you want to find out the winner of our “Cosplay Girl of The Year 2012”, then watch this episode all the way to the end because we spill the beans! Oh, we also talk about comics and Matt Todd of “The Impact” tells us of all the latest news in Film and Television! Still not enough to entice you? Man, you are a tough customer! We also have Sheldon talking about Sam Humphries book Sacrifice, and Simon shows us a really cool Avenger’s Omnibus that came out! Convinced yet? No?! Ok, ok how about Susan talking about David Lapham’s book Ferals! Now we are talking, right? We also talk about The new Before Watchman comic coming out by DC and Avengers vs X-Men…2 MONTHS! Yeah I know we find it a bit of overkill as well. All of that packed into a month of just 29 days and we then turn around and pack that in a 15 min show just for you. We think you are kinda special, just sayin. Punisher Max #22 by Jason Aaron and Steve Dillon.